Whether you’re passionate about covering Premier League football, the Olympics, Formula One or netball, this course equips you with the skills to build a career in one of the most competitive areas of the media. with words, pictures or audio across all platforms, including social media. Alongside this you develop your critical skills to tackle key questions such as doping, corruption and equality in sport. You learn by doing, building an impressive portfolio of published work, and have the opportunity to report on live football at Middlesbrough Football Club. In Year 1 you learn the basic tools needed to start producing quality journalism that is both ethically and legally sound. You go on to develop a deeper understanding of the work of a sport journalist and explore your own interests. 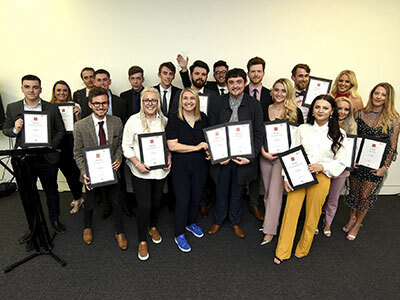 In the final year you take a leading editorial role in content creation for the Tside, our unique multimedia platform which includes a website, social media channels, print publication, TV and radio show, whilst drawing on your existing sports skill set to build your own sport journalism digital business. This course is accredited by the National Council for the Training of Journalists (NCTJ). This means that you study for your professional (pre-entry) qualifications alongside your degree, with no additional tuition charges. The NCTJ Diploma in Journalism allows you to work in any field of journalism. This degree is accredited by the National Council for the Training of Journalists (NCTJ). This means that you study for your professional (pre-entry) qualifications alongside your degree, with no additional tuition charges. The NCTJ diploma is a vocational qualification that is widely recognised and highly valued by journalism employers. Research by the NCTJ in 2015 found that 96% of those who pass its diploma at the ‘gold standard’ level were in work 6-10 months after completion, the overwhelming majority in a journalism-related job. Candidates are expected to enter all the NCTJ’s mandatory exams in reporting, essential public affairs, essential media law and shorthand, and to complete the multimedia portfolio. Year 1 gives you all the tools you need to start producing quality journalism that is both ethically and legally sound. You work on the Tside website to develop skills producing quality written, audio, video and social media content. In Year 2 you develop a deeper and more sophisticated understanding of the work of a sports journalist, and are given the opportunity to explore your own interests through a series of multimedia news days. In the final year you take a leading editorial role in content creation for the Tside brand whilst drawing on your existing sports skillset to build your own journalism digital brand. You develop your entrepreneurial abilities to explore ways of monetising your ideas - focusing on the content you love to create. You explore the basic technical components of the process of making video or audiovisual materials for outputs such as online publishing, documentary or drama. You are introduced to media languages and how to communicate clearly to target audiences. The module is project based and you carry out writing, composition and editing of your own short video or online publication. You learn basic skills in risk assessment for technical equipment, filming, editing and using online resources. Your assessment is the creation of a video in response to a brief and the submission of a written review. Here, you apply acquired knowledge and skills to a selected project according to an area of your individual interest or specialism. This module provides an overview of professional graphic practice and enables you to reflect on your own learning and personal career aspirations. You review work from modules through your portfolio presentation and set goals for the next stage. You explore learning skills for undergraduate study at University, providing you with a range of learning material and practical sessions. You develop your professional skills including teamwork, researching a topic, report writing and delivering presentations, as well as time management and learning practice. You learn by a combination of lectures, e-learning material and support. You are introduced to the Virtual Learning Environment (VLE) at Teesside University, exploring e-learning material and reading lists, and student support and learning resources. Your assessment is a portfolio based on set tasks, including research into set problems. You explore a range of contemporary media theories and ideas in their broader historical, social, cultural, technological and economic context. You learn how these contexts can help us understand the power and influence of the media and how to begin to read the media through identifying codes and conventions. Your assessment is a short essay that researches one area of media production. This module looks at the ideas, concepts, and practicalities of developing a professional online presence. It takes a critical look at social media and considers how best to make use of existing online communities and tools. You design and create something that represents you in an online presence, using a range of available technologies and third-party applications (web authoring, blogging systems, social media, file sharing and networking systems), to act as a PR tool in promoting your career or specific media-related activities to a specified audience. This module builds on the skills learnt at Stage 1 in Multimedia acquisition, editing and production and further introduces the additional skills of still image acquisition and manipulation and animation for the web. These are explored in an interconnected way to critically examine the developing field of interactive narrative, in particular the professional practice of news production within this context. This module gives you the legal and ethical training required to practice as an effective, professional journalist. You learn about the judicial process and areas such as contempt, defamation, sexual offences, youth courts, inquests, copyright, privacy and ethics. You will also work towards your NCTJ Essential Law and Court Reporting exams. Preparation for your future career begins in your first year at Teesside. You learn how to market yourself to media employers whilst participating in live newsdays alongside second and third-year students. You develops understanding of sport in its wider historical, social and cultural context. You explores key debates in sport journalism by providing a theoretically and critically informed understanding of the sport industry. You critically engage with existing and emerging issues in sports on a global, national and local level such as representation, social stratification and division in sport, and social fandom. You gain a critical understanding of the social responsibilities and expectations of a sport journalist. This prepares you to be able to report on a wide range of sport related issues, which often spill over to the news pages. Your assessment is 100 % ICA, group presentation and essay. You explore the core journalistic skills of sport reporting on digital platforms. You consider pre-event research, player and team performance, statistics and live coverage such as blogging. You learn to write effectively for different audiences with an understanding of the varying values, agendas and expectations associated with sport for example, fans vs general supporters and clubs vs media organisations. You focus on maintaining objectivity, etiquette associated with sport reporting, developing interview techniques and the gathering, communicating and dissemination of sport content. Your assessment is 100% ICA, a journalistic portfolio of sport writing. You explore a range of technologies, platforms and techniques, existing and emerging designed to connect, build and engage audiences. You build your skills in developing and producing content for digital platforms, such as, Search Engine Optimisation, audience analytics, engagement metrics, online communities and social media. Your assessment is 100% ICA: small scale campaign and report. This hands-on module teaches practical programme making skills enabling you to write professional-standard scripts and voiceover commentary. With HD broadcast standard recording facilities at your disposal, you produce features, film interviews and sequences. You gain practical skills needed to become multi-media sports journalists. You focus on how to deal with the demands placed on a journalist when covering live sport events. You learn how to produce accurate, informative and entertaining sports reports to tight deadlines, produce compelling content, attention grabbing headlines and identifying the best angle. You are expected to attend live sport events to put your learning into practice. Your assessment is 100% ICA: match report and reaction piece. Fake news has been around longer than we think (Orson Welles invaded America with Martians on the radio over 70 years ago). This module helps you to understand how news can skew stories across a range of topics. You get the chance to create your own journalism portfolio where you approach stories from a myriad of different angles. Is the truth out there? Sport is more than just a game. It is big news and big business. Sport journalism is one of the fastest growing sectors of the British media industry. This module digs beneath the surface of match reporting and explores the theoretical debates surrounding sport, the media and society. You develop professional practice skills in concept art, through appraisal and evaluation of industry standards, culminating in an online presence and professional identity. You are encouraged to analyse and evaluate elements of professional practice and synthesise your findings into your own practice, demonstrating employment potential and future professional development. Teesside University takes employability seriously and this module enables you to broach the gap between university and the workplace by preparing you for interview and job selection processes. As a third-year student you take on the role of editor for the print publication, TV news programme, and Tside radio show. You explore the workings of a modern democracy, particularly how the structures and systems of local and central government and other public institutions impact on the practice of professional journalists. You develop your knowledge of council agendas, government sources and data and take part in a visit to a local council meeting. Your assessment is 100% ICA: 50% journalism artefact and 50% exam. You consider, engage and analyse a range of key issues around enterprise and innovation when developing a professional digital publishing plan and pitch. You research audiences, investigate and explore existing and emerging technologies and platforms, marketplaces, human factors, digital conventions and aesthetics. You develop your commercial awareness and business acumen; understanding existing and new digital business models, its challenges and opportunities. You develop an idea and plan for a new concept or an innovation based on an existing business. You produce a detailed digital business plan, which presents and argues the case from a technical, audience, journalistic, content and commercial perspective. Your assessment is 100% ICA: pitch and business plan. This is a self-managed project of professional practice and reflective consideration. You work individually to produce creative work as a finished multimedia web site demonstrating skills in the newsgathering, production of multimedia sports journalism including audio, video, layout, typography, web design and associated technologies. You also produce a critical essay, examining a key issue of professional practice raised in the creative process. Your assessment is 100% ICA: website, individual project and essay. Sport and sporting brands have significant power and influence uniting audiences across the globe. You explore the relationship between sport journalists, sport organisations, brands and audiences. You draw on current industry practice to develop transferable skills required in digital sport communications examining commercial sponsors, brand endorsements, marketing messages, campaigns and public relations. Your assessment is 100% ICA: promotional video and reflection. A full range of the latest digital resources, software and digital recording equipment supports the newsroom environment. Independent and student-centred learning are encouraged in addition to taught sessions with staff. The ideas that underpin modern journalism are examined through a series of issues and debates considered in a series of illustrated lectures and seminars where there is opportunity for lively discussion. The core learning, teaching and assessment tool for practical journalism is the Tside website which enables you to produce real content for a publicly facing platform. You also create your own digital platforms supported by the University an enabling you to develop open source web development skills. Work created as part of assessment builds a professional portfolio of content, which you are able to take out into industry and show perspective employers. A typical offer is 96-112 tariff points from at least three A levels (or equivalent) – one must be in an appropriate discipline, or 64-80 for entry to Year 0 (Foundation Year). Applicants are normally invited for interview. The purpose of the interview is to determine each applicant's potential to succeed and assist in the setting of appropriate entry conditions matched to their personal circumstances and the demands of the course. The interview also enables candidates to see our excellent facilities, and meet staff and students. Each applicant will normally receive an individualised offer following their interview. Graduates have progressed to cover sport for Sky Sports and BBC Tees. Work experience is integral to this programme. We have long-established contacts across regional and national media, including The Gazette, Sky Sports News and i newspaper, as well as with partner sports organisations including Middlesbrough Football Club and Tees Valley Sport. TUxtra is the new integrated media publishing platform for media and journalism students at Teesside, bringing together exciting and innovative content on-air and online. What do students do all day? If you study journalism at Teesside University, this is what you do. Katie's time at Teesside has led to her landing a role at Made TV. Paul is well on his journey to working in film journalism and becoming a critic. Sam has already had the opportunity to work with Sky Sports boxing and is excited for what the future holds.